For Statehood Day, We Asked The Age-Old Question: Louisville Or Kentucky? 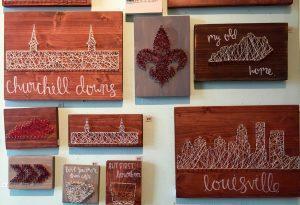 A display at Revelry Boutique Gallery in NuLu pretty much hits the nail on the head. Today is Kentucky’s Statehood Day. It was on June 1, 1792, that Kentucky officially became the 15th state to join the United States of America. The past 224 years have been full of momentous occasions for the commonwealth — industrialization, wars and the resurgence of bourbon’s popularity. 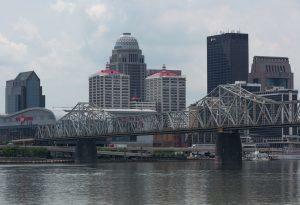 But here in Louisville, many residents seem to have a complicated relationship with Kentucky. The state’s largest city often differs politically from the Republican-leaning rest of the state, and many Louisvillians identify culturally with the city rather than the state as a whole. So, in honor of Statehood Day, we decided to ask a few Louisvillians on East Market Street a simple question: Do you consider yourself more a Louisvillian or a Kentuckian? Kentucky has more miles of running water than any other state in the lower 48 (only Alaska has more). With the commonwealth’s numerous rivers and water impoundments, there’s a total of 1,100 commercially navigable miles. John T. Thompson, a Newport, Kentucky native and U.S. Army officer, invented the Thompson Machine Gun. Nicknamed the “Tommy gun,” it was widely embraced during the Prohibition era by organized crime gangs. Most of the soldiers killed during the War of 1812 were from Kentucky. According to Kentucky Educational Television, 64 percent of Americans killed in the war were Kentuckians. Man o’ War, one of the most famous horses ever born in Kentucky, never ran a race here. According to the National Museum of Racing Hall of Fame, owner Samuel D. Riddle decided to pass on the Kentucky Derby in favor of having “Big Red” make his 3-year-old debut in the Preakness. Man o’ War easily won and went on to also win the Withers, Belmont (a 20-length victory), Stuyvesant and Dwyer.